I used Red Heart yarns in navy blue and melon green to complete the lapghan. I crocheted 4 rows in each color. I started the lapghan with a chain of 107 in navy blue yarn which resulted in a mini blanket 34 inches wide. I completed a total of eleven rows in the 4-row combos to make a 30 inch long lapghan. Of course you could continue in the pattern for a longer blanket but this is being used in a wheelchair so they requested shorter lengths. 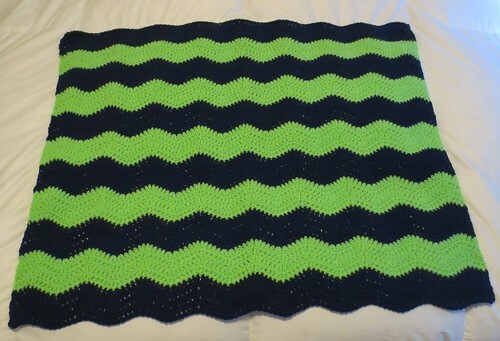 In case you didn’t notice, I crocheted this lapghan in Seattle Seahawks colors and hope whoever receives this charity blanket loves the Seahawks as much as I do. Go Hawks!